As the leading tissue bank in the world, we’re confident in our safety and quality. MTF Biologics offers a 90-day Guarantee on tissue used in breast reconstruction. 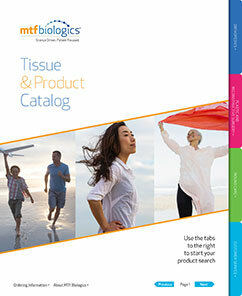 We are confident in our tissue and you can be too. When you choose FlexHD® for breast reconstruction, you choose the highest quality ADM supported by a 90-day money-back guarantee. If for any reason FlexHD must be removed, we will credit you the value of the graft for use in a future case. Like you, we are committed to doing our part in putting patients first. When you start with better tissue, you end with better tissue. We accept less than 2% of donated tissue—leading the industry in the highest acceptance standards. We believe in minimal processing to preserve the natural structure and properties of the tissue for better outcomes. Each and every donor is tested to ensure sterility before it is released for use. This unique approach is set and governed by surgeons for the highest level of patient safety. The FlexHD 90-Day Breast Reconstruction Guarantee is our pledge that we believe in our tissue and so can you. Contact your MTF Biologics Surgical Consultant for more information.